Twincraft Skincare has been making bar soap since 1972, but we didn’t want to limit ourselves to one product type. For the past few years, we’ve been developing and rapidly growing our liquid skincare program, making high quality, mostly natural skincare for some of the world’s best known brands. Our liquid skincare development process starts in our 5,000 square feet state-of-the-art Innovation Center at our Winooski, Vermont headquarters. 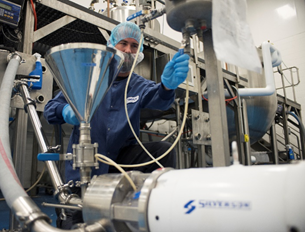 Once a formula is approved by a customer and undergoes all required testing, we move the process over to our much larger liquids production facility in Essex, Vermont. A short drive away from our bar soap manufacturing plant, you’ll find over 70,000 square feet of production, offices, and warehouse facilities. From the first day that we decided to explore producing liquid skincare in addition to bar soap, the Twincraft team has been devoted to developing a program with a commitment to the highest standards of hygiene while creating an environment that can grow and evolve with our business and the industry. Our liquid product facility is home to Class 6 Cleanrooms, which are under positive pressure and undergo air changes 18 times per hour, ensuring that open product are limited in their exposure to possible contaminants. All raw material sampling and weighing is done in a cleanroom, all containers are processed in a cleanroom, and our entire compounding area is a cleanroom as well. Our purified water system is tested and sanitized monthly, and medical-grade compressed air is used throughout the facility. We ensure that all employees adhere to the highest level of GMP requirements, and anyone who is involved in production activities is required to wear smocks, hairnets, beardnets (if applicable), and gloves. We are always adapting and evolving our manufacturing process, facility, and teams to ensure that we are performing at our best, with the priorities of each business partner in mind. At our Essex, Vermont facility, we are prepared with our existing infrastructure to install two additional cleanrooms when the need arises. We pride ourselves on having in-house machine building and programming capability, as well as an on-site Quality department. While Twincraft may only have a few years of liquid product manufacturing experience, especially when compared to all of the time that we’ve spent making bar soap, we’ve recruited some of the best, and most capable team members to ensure successful production runs. Together, they have decades of personal care manufacturing experience, and welcome each opportunity to problem solve and create with each of our customers. 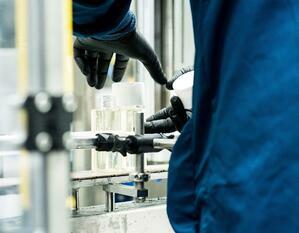 We designed our batching process to be fully scalable and flexible to meet both small and large customer needs. Our two small batch vessels allow for piloting and scale-up testing, while our large-scale fixed and mobile batch vessels provide flexible batching options. These modern tanks feature internal homogenization, vertical and propeller agitation and surface scraping; they also feature electric remotes and hydraulic heating and cooling controls. With this technology, we're able to produce an accurate, consistent temperature and maintain process control from emulsion to production. 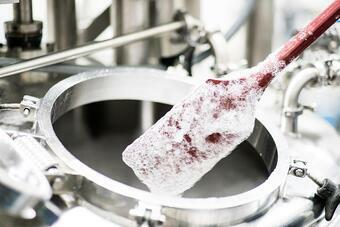 From beginning to end, hygiene is at the forefront of our batching process. We utilize compressed air as well as a de-ionized, Direct-to-Tank water delivery system to ensure the highest purity of any elements that may come in contact with products. To protect the environment, we test and treat our wastewater from these processes regularly before it is discharged into the local wastewater system. Twincraft's flexible filling process is designed to meet your product and packaging needs for filling and finishing your products. 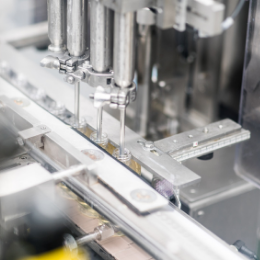 Our technology includes multi-head piston fillers that fit both metal and plastic tubes, jars and bottles, and can handle product viscosities ranging from water thin to butter thick. Our peripheral finishing equipment is both in-line and mobile, which allows lines to be custom configured for each production run, adding efficiency. Caps can be automatically added and tightened for consistency or place by hand, to intentionally allow for rapid, no-cost changeover. And, we automatically assemble shipping cartons to support both small and large unit counts. Our capabilities include squeeze tube filling; we can fill, label, and close both metal and plastic tubes, ranging from .5 to 8 fluid ounces. And, with multiple lines, we are able to produce over 150,000 units per week. With our dynamic labeling technology, we offer multiple labeling options as well as orientation and cap features. With our flexible process, we can customize our production lines to meet your product needs and turnaround change parts in less than 30 days. Our liquids facility can fill both bottle and jar containers ranging from .5 fluid ounces to over 1 liter, for both low and high viscosity products. With both fixed and mobile fillers, we adapt our filling process to your batch size from small pilots to bulk orders. Containers can be induction sealed and labeled on any side or direction, including wrapped. We place caps manually to eliminate changeover costs, and our proprietary equipment ensures consistent closure and tightening.